Dachshund Dogs - The Dachshund is a short-legged, elongated dog breed of the hound family. The breed's name is German and literally means "badger dog," from (der) Dachs "badger" and (der) Hund "dog". The breed was developed to scent, chase, and hunt badgers and other hole-dwelling animals. Due to the long, narrow build, they are sometimes referred to in the United States and elsewhere as a wiener dog, hot dog, or sausage dog, though such terms are sometimes considered disparaging. Within Germany the breed is known, both formally and informally, as the Dackel or Teckel. This information is licensed under the GNU Free Documentation License. It uses material from the Dachshund article on Wikipedia.org. Dachshund Breeders - Advertise your kennel puppies and dogs here. BC Sundance Kennel - New York - Mini AKC reg. Dachshund puppies. See website for info and photos. Findore Pups-R-Us - Louisiana - We breed mini dachshunds with TLC bred for healthy pets with good temperament, color and conformation. Variety of colors. Meldox Dachshunds - Florida - We are a small kennel located in the SOUTH FLORIDA AREA. I am a VETERINARY TECHNICIAN with 17 years experience in animal Health Care. 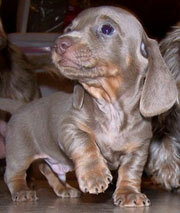 We specialize in Miniature-Longhair Dachshunds in Rare colors, including Dapple and Piebald patterns! We socialize our puppies with kids and cats. We have happy and healthy puppies without hang-ups. We give our pups their first (2) vaccinations, worming and they come with a Written Guarantee. We breed for Health, Temperament, Color and Conformation in that order. Contact us (Toll Free) at +1 (888) 998-7483 for prices and upcoming litters. Guardian Dachshunds - Minnesota - Guardian Dachsunds is a small family owned kennel raising quality miniature Dachshunds for pet and show. Check our website for beautiful, reasonably priced pups of sound health, temperment and conformation. Grendox Dachshunds - Kentucky - AKC miniature Dachshunds exclusively! Bred for temperament and conformation, smooth, long and wire coats in all colors including English Cream, Chocolate and Cream, Isabella, Blue, Chocolate, Piebald and more. Pups available now. Key City Doxies - Iowa - AKC Miniature Dachshund puppies available year round. Written health guarantee and safe shipping available. Sugarhill Miniature Dachshunds - California - We offer exceptional, adorable AKC registered Miniature Dachshunds. In a variety of colors and patterns. Gorgeous Imported creams. We place our puppies with families on spay and neuter agreements. Must Love Puppies - Iowa - We raise mini Dachshunds,Cockabichons,Cavachons and Eskichons. We offer many varieties of non shedding hybrids. Vet checked and guaranteed! Shipping available. C & G's McLilpaws - Florida - We breed AKC dachshunds in a variety of colors and patterns including English Cream, we also have smooth, long and wirehair coats. Written health guarantee and shipping available. Windsor Dachshunds - Pennsylvania - We breed quality Longhaired Mini Dachshunds, including English Creams, for loving homes. Please visit our website. 3 Aces Ranch Dachshunds - California - Here at 3 Aces Ranch I raise high quality AKC registered Mini Dachshunds and have the perfect Doxie puppy for you. If we are in between breedings I will put you on my mailing list that keeps you up on all the new litters. Blue, Silver, Black & Tan, Solid Black, Cream, Isabella, Izzy, Chocolate & Tan, Chocolate & Cream, Dilute, & Red's Solids, Dapple and Pie Balds. Wire, Long Hair & Smooth Coats I have lots of Doxie friends so I can set you up with the perfect puppy if I don't have what you are looking for. My dogs and I reside on my six acre ranch in California which is located up in the mountain's in the KERN RIVER VALLEY, LAKE ISABELLA, KERNVILLE area. About 1 hour NE of Bakersfield CA. It is a wonderful vacation spot and you can enjoy some river rafting, hiking, water or snow skiing, and a whole lot more when you visit the ranch. All my long and low are house dogs and all pups are whelped inside and are well socialized. All of our pups are waiting to keep your feet warm at night, however some are known to steal your pillow! They are the best snuggler's in the world. My dogs are all AKC registered and come with a health guarantee and puppy contract. ~*~Rosewood Miniature Dachshunds~*~ - Georgia - I am a small hobby breeder of purebred Miniature Dachshunds. I breed and raise smooth coats and long coats only. All of my Miniature Dachshunds are dual registered to both the American Kennel Club and the United Kennel Club. Stud service is available to approved females only. Doxie Chicks Kennel - Colorado - We raise long and smooth coat dachshunds in colors of cream blue, isabella, dapples, piebalds, brindle, and chocolate. Our puppies are socialized and given their first shots and wormed as well as AKC registered before going to their new homes. XO Doxies - New York - We breed home raised quality miniature dachshunds, with a 1 year health guarantee against genetic defects. All our dogs are kid tested and mother approved. We specialize in English Creams,Chocolates and a variety of other colors and patterns. Stop by our website and find the puppy of your dreams. Kiss and Hug A Pup Today!